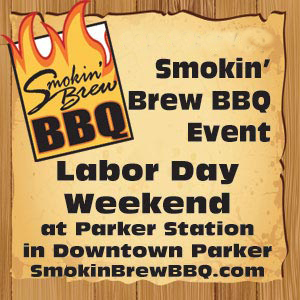 Some of the country’s top barbecue experts will be in Parker to compete in the Seventh Annual Smokin’ Brew BBQ over the Labor Day weekend. Hosted annually by the CCV Rotary Club of Parker and sanctioned by the Kansas City Barbeque Society, the Smokin’ Brew contest is expected to draw more than 20,000 people to the PACE Center parking lot to watch the BBQ competitors, eat some great BBQ and listen to a line-up of talented musicians. Among the 2015 competitors are this season’s BBQ Pitmaster stars and two-time champion, Boyd Abts & Tim Grant of Truebud BBQ , who will be seeking a three-peat as Grand Champion; and Johnny Trigg, who is considered the godfather of BBQ, has also appeared on TLC network’s BBQ Pitmasters four times and is a two-time winner of the Jack Daniels’ World Championship BBQ Invitation. They will be facing the likes of Travis Clark of Clark Crew BBQ, who currently is #1 in the nation; America Dream Team and Big Poppa Smokers, currently #3 and #4 in the country, respectively; the Colorado-based Backdraft BBQ, 28th in the country; and Burning Bob’s Butts and Bones, a team that has won the Rocky Mountain BBQ Team of the Year four times. The 2015 event at the PACE Center will kick off at 4 p.m. Friday, Sept. 4. The festivities will conclude with an awards ceremony at 5 pm on Sunday, Sept. 6, after the judging of entries submitted by the 55 competitors who want a piece of the $8,500 in prize money. In addition to the BBQ, guests can enjoy some great entertainment, which begins at 5 p.m. Friday with the Blush Band and the Bluzinators. The full entertainment lineup is listed below.